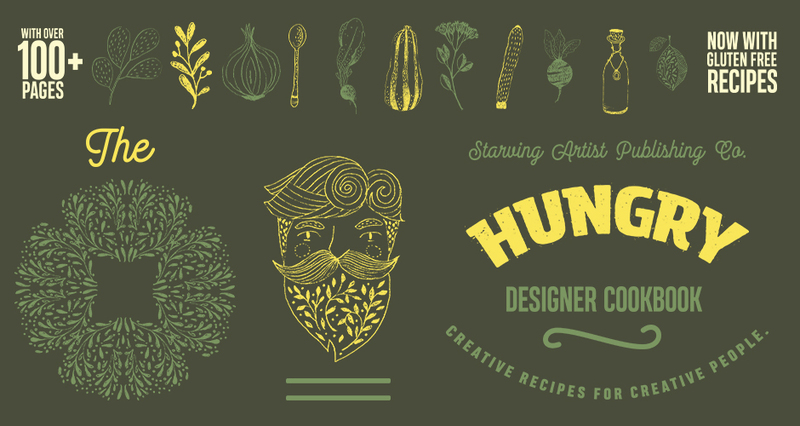 This freebie pack includes a variety of hand drawn vegetables and cooking utensils illustrations and modern typefaces that we will be using to create our cookbook cover. These are great! Thanks all! Aw thank you so much Kitty 🙂 Happy designing with your new purchase! Thank you! so generous and such high quality. Appreciate you all. Thank you so much; I’m new to all of this, and its so generous of you to share for free! Lovely designs! Thank you so much for commenting and we hope that you have lots of fun building your resource collection with us! Happy designing and if you ever have any questions, we are always happy to help! Aww thank you so much for your lovely comment Marianna and welcome to the Design Cuts community! We hope that you have lots of fun checking out some great new design resources for your collection, happy designing! Great stuff. THANKS! What license comes with this? Extended??? THANKS, THIS IS AWESOME! LOVE IT! Thanks so much for the lovely comment and we are so, so happy to hear that 🙂 Happy designing! Great – as always!!!! Thanks for helping us….. Thank you so much for all the great stuff you provide!!! Como siempre, un tutorial magnífico. Muchas gracias. Great freebie pack and tutorial. Thank you. Thank you for this tutorial, and the sample pack to follow along. Thrilled to hear you love it 😀. We’re so glad we could share them with you!